Michelle Rodriguez, from LOST and Avatar fame, clearly plays a lot of videogames. Let me begin by saying that I think I'm in love with Michelle Rodriguez. I mean, I've always liked her roles before, but her appearance at a panel promoting Columbia Pictures' Battle: Los Angeles kind of blew me away. You may have seen Rodriguez play Ana Lucia in LOST or the pilot Trudy Chacon from Avatar, but she's appeared in many tough girl roles ever since Girlfight in 2000. She didn't come out and explicitly state that she is gamer, but it was clear from how she described situations and told little stories that she spends a huge part of her time with a controller in hand. The first clue was when she was talking about the military training she went through to prepare for her role in Battle: Los Angeles, the plot of which follows a marine platoon as it weaves its way through a city invaded by aliens. "I learned how to take apart an MC4 in under a minute. With a pen," she said. "You don't learn that from Modern Warfare." Later, Rodriguez described her reaction to being screened a forty minute portion of Battle: Los Angeles, which if what we saw at the panel is any indication is very visceral and suspense-filled. "I grabbed an imaginary Xbox controller and tried to move out of the way," she said, mimicking the movement with her hands. Rodriguez gave props to the director, Jonathan Liebesman, for shooting the movie in such a "first man shooter" style. "I think that there's a lot of influence in our generation from videogames," Liebesman said. "Embedded war footage is very first person so the movie does feel a bit like Modern Warfare, a bit like Halo." Playing physical roles isn't a problem for her, she said that she gravitates towards characters who use their physicality without losing femininity. But again, her gamerness started to show. "Playing a tech sergeant was the hard part because I had to geek out a bit. I'm used to doing that in my spare time, not when I'm working." As if Rodriguez's predilection towards geekery wasn't enough to make me fall in love with her, she made me laugh out loud with a gem that I'll remember for a while. 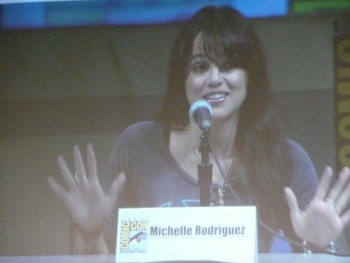 An audience member asked whether, despite Rodriguez's reputation for playing a kickass females, she ever thought of playing a role in a romcom or something more dramatic. She responded, "What, you mean like get raped and win an Oscar?" How can you not love a girl with a mouth like that?